An instructor at Tyndall Air Force Base in Florida looks down over a simulated coastline from the cockpit of an F-22 Raptor simulator equipped with Boeing's Constant Resolution Visual System (CRVS). ST. LOUIS, Oct. 2, 2015 – Boeing [NYSE: BA] has completed its upgrade of all U.S. Air Force F-22 Raptor Mission Training Centers with its high-fidelity Constant Resolution Visual System (CRVS). The system trains pilots in a more realistic visual environment than current simulators and allows them to experience extreme maneuvers that typically are only practiced in a simulator. The final CRVS installations were recently done by Boeing and the Air Force at Tyndall Air Force Base in Florida. Simulators at Hawaii’s Hickam Air Force Base, Alaska’s Elmendorf Air Force Base and Virginia’s Langley Air Force Base, also have the system. "The final installation of the Boeing Constant Resolution Visual System improves the realism of ground-based training and increases mission readiness for pilots," said Lt. Col. Matthew Zamiska, 325th Training Support Squadron commander. "This is paramount for Tyndall's mission of training and projecting unrivaled combat airpower." 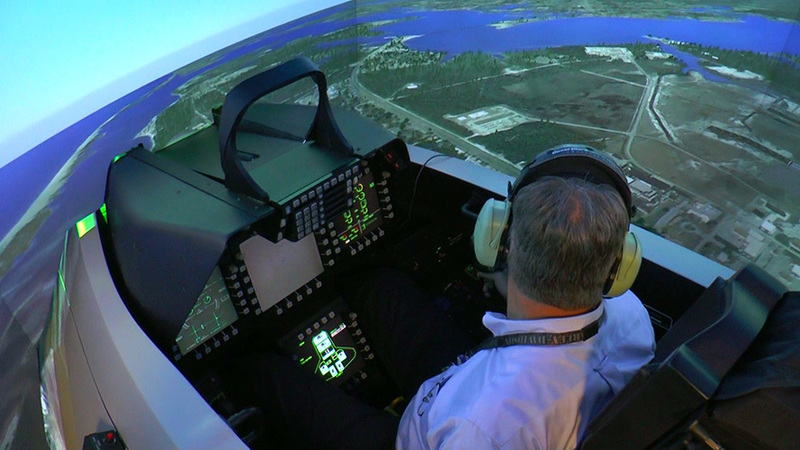 Boeing’s patented CRVS display is the centerpiece of the training suite and provides high-resolution imagery for pilots with nearly 20/20 acuity in an immersive, 360-degree visual environment. By using off-the-shelf projectors, the system takes advantage of the rapidly emerging commercial technology. CRVS, first delivered in 2010, is found in a variety of other aircraft simulators, including the F-15 Eagle, AH-64 Apache, M-346 Master, BAE Hawk and F-16 Fighting Falcon. A member of the F-22 Raptor team with Lockheed Martin and Pratt &Whitney, Boeing develops, integrates and delivers F-22 aircrew and maintenance training systems to the Air Force, along with logistics and sustainment services.